Hi. Time for another $5 Friday-a meal for two for less than $5. These are just things I cook you know. 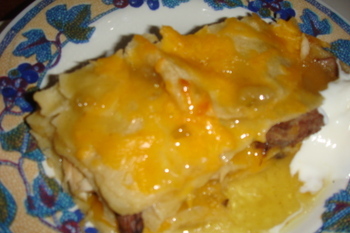 I like the flavors of enchiladas but sometimes don't have much time to make them properly, individually rolled up. OK. I haven't made 'proper' enchiladas in years. The main "hint" I can tell you about making enchiladas is to briefly dip the corn tortillas in hot oil. 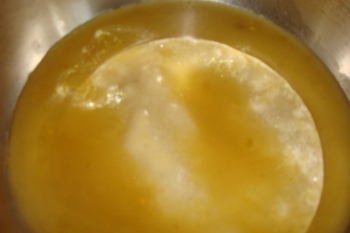 Just a few seconds; flip it..
Then dip the still-dripping- with-hot-oil tortilla into warm enchilada sauce. In this case, I was using green sauce, but you can use red sauce, whichever is your preference. Oh. 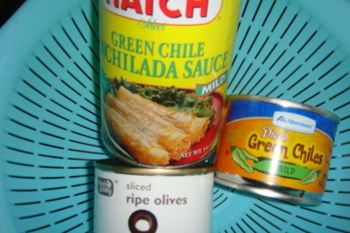 These can be your main ingredients, along with grated cheese, corn tortillas and some oil (used above). Put one layer of the sauced tortillas on the bottom of a baking pan (I use a 9x11 glass pan). 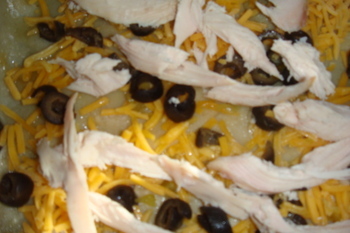 Toss on some grated cheese (I use sharp cheddar, but you can use a cheddar-jack mix or a "Mexican cheese" mix). 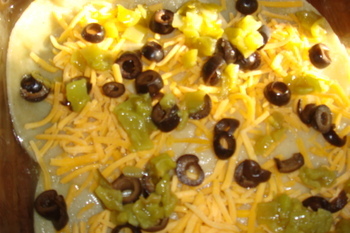 Here is variation #1: top the cheese with canned green chiles and chopped olives. 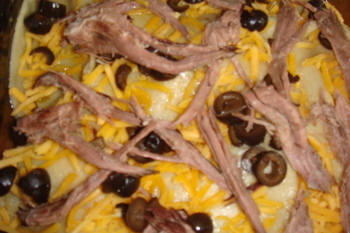 and/or, variation #3: leftover shredded beef (from a pot roast, maybe? )(next week). 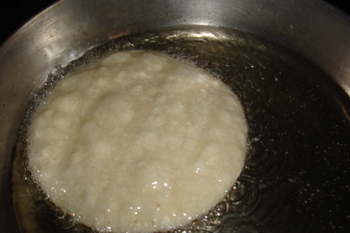 Do the same (oil, sauce, cheese and topping) for at least one more layer. 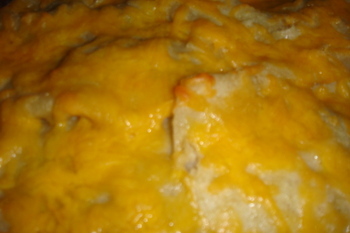 The pour any extra enchilada sauce on top and put cheese on the top layer. I end up using at least 3/4 lb of shredded cheese for a 9x11 pan. Since everything is cooked, you just pop in the oven until the cheese is melted, maybe 20 minutes in a 350° oven...look at it...You'll see when the cheese is melted. I serve mine with some sour cream on the side. Viola! Hop everyone has a good weekend. Now I wish I had asked the Mister to make enchiladas instead of tacos for dinner. Looks really good! What a pain in the arse to roll up these babies. I feel your pain. Really simple, too, Carol. All the flavor and none of the work...I am kind of torn between calling it $5 Friday and "Lazy Meals"
Oh, it is way too much trouble to roll up individual enchiladas, Bill. When I eat these at home or take to a friends house, it makes no difference. This look delish! I will definitely try this one. I frequent your site and I love it! It is so simple, Ms. J, you'll do it this way from now on... Welcome to the comment side of the blog. Yum! I love that it is inexpensive and tasty! I just never had talked about how I cook at home on this blog, Megan and am glad to hear good responses. Thanks.